UPDATE: Now for Windows 10 too! Cressida for Windowblinds has now been updated to work with Windows 7, 8 and 10. 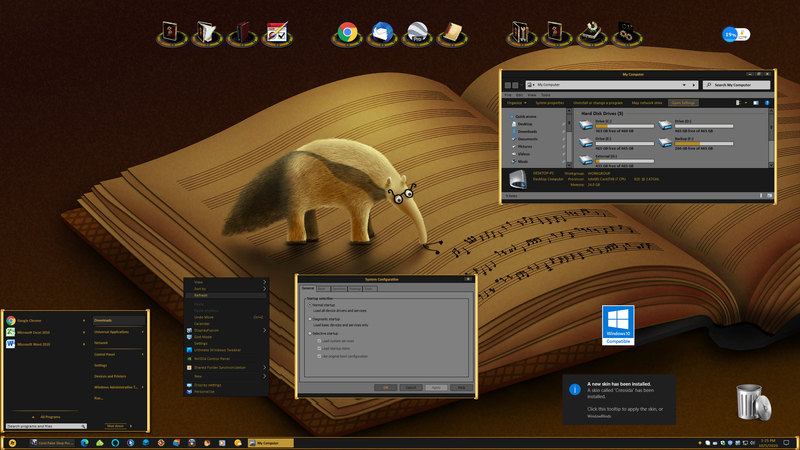 That cute desktop wallpaper shown in the screenshot is called Music Eater from VladStudio ( Link ), the Iconpackager set is called Nordagan by Z71 ( Link ), and the tray clock and desktop calendar are part of Atomic Clock 6.12 ( Link ) from the Drive Software Company. I hope your enjoy Cressida and thanks to my friends vStyler and DrJBHL for their initial testing and input into the design of this skin. A beauty Tom, good job, thanks! This is a wonderful skin. I love the color scheme and the detail. This may be my favorite of yours. Very not bad Tom. Me likey this one. I thought I commented here, oh well, better late than never. This one has a bit of a 3D look that I like! Another great skin! Thank you! Very clean very slick & very on my desktop now. very simple, and user friendly, awesome work! !